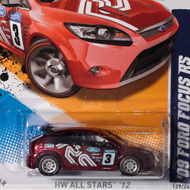 2/10 of the HW City Works ’12 series and part of the 2012 Secret Treasure Hunt set. 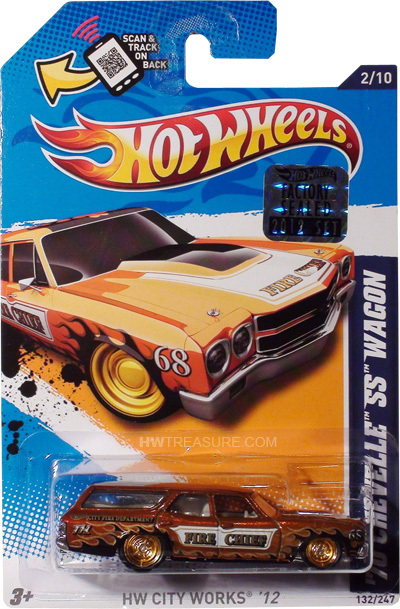 The wagon has brownish-orange Spectraflame paint detailed with black & gold flames plus “68” on the sides and roof, “FIRE CHIEF” on the sides and hood, as well as “CITY FIRE DEPARTMENT”, “TH” and the Hot Wheels logo on the sides. 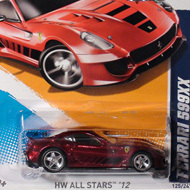 It has clear windows, a white interior, gold Real Rider Steelie wheels, and a chrome plastic Malaysia base.